New Delhi: The O P Jindal Group of companies collaborated with UN Women, United Nation’s entity dedicated to working towards gender equality and women empowerment, on the occasion of International Women’s Day (IWD), as the conglomerate hosted a gala event today at India Habitat Centre. 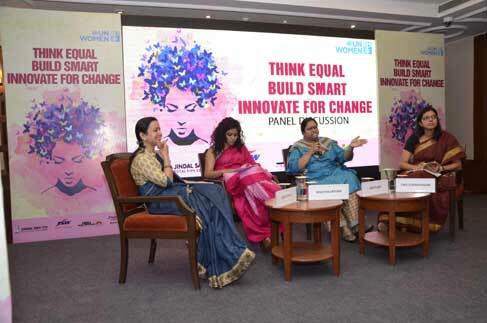 The event epitomized this year’s International Women’s Day theme for UN Women, ‘Think equal, Build smart, Innovate for change’, laying focus on advancing women’s leadership in corporate roles and boosting participation in strategy and planning ranks right from inception, irrespective of the business. The event witnessed the presence of leading women dignitaries including Kuchipudi artist and President, JSPL Foundation, Ms Shallu Jindal; Managing Director, Jindal SAW Ltd., Ms Sminu Jindal; Founder, Swift Media International, Ms Srishti Jindal; Former Ambassador of India to the Netherlands, Ms Bhaswati Mukherjee; Deputy Country Representative, UN Women, Ms Nishtha Satyam; Founder and Co-Director, Aarambh India Initiative, Ms Uma Subramanian; Marketing, Branding and Communication Specialist, Prof Shruti Jain; Diet & Lifestyle Specialist, Ms Saumya Hinduja, along with Cancer Specialist, Dr Neerja Gupta. The O P Jindal Group pledged allegiance to the empowerment principles of UN Women. IWD 2019 theme of UN Women reflects the idea that people should have complete access to technology and finance, irrespective of their gender, for them to engage fully in the economy. Such engagement of all genders in an organisation fuels social as well as economic prosperity, irrespective of the sector. The event aimed at not only providing the right exposure to the issues and discrepancies faced by women at the management and employee ranks, but also to find a solution. Apart from the corporate world, women are making a place for themselves today in some of the major all-male bastions, like transportation, masonry, plumbing, etc. However, a pool of opportunities in India still remains untapped. Statistics from various sources indicate that the situation of women is a graph of multiple highs and lows. As per Economic Survey 2017-18, it is observed that there has been a notable progress in the percentage of educated women from 59.4 percent in 2005-06 to 72.5 percent in 2015-16. However, in administrative roles, the survey reveals, only 9 percent women are members of legislative assemblies (MLAs) amongst 4,118 members across the country. Although ‘Women in Business’, a global survey in 2018 by Grant Thornton, ranked India third in business leadership roles held by women consecutively for the third year, a lot still needs to be done. Despite unprecedented opportunities in ‘Innovation and Technology’, industry trends indicate a growing digital gender divide as women continue to be under-represented in the fields of science, technology, engineering, mathematics, and design. The gathering delved into measures to accelerate progress on this front by breaking the constraints that hinder women’s participation.